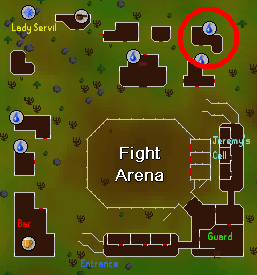 If you are looking for the modern RuneScape guide for this content, please see our Fight Arena guide. The prosperous Servil family have been abducted by the infamous General Khazard. He plans to have the family battle for his entertainment in the Fight Arena. Can you rescue the Servils before the tyrant has these innocent (not to mention wealthy) civilians slain? Begin by speaking to Lady Servil to the northwest of the Fight Arena west of Port Khazard. Inside of the house is a chest, and after searching it you'll find a Khazard Helmet and Platemail Body . Go south of the house to the prison, and wear the Khazard Armor. Talk to Jeremy Servil, and he will tell you that the guard has the keys to the prison. Go to the southeast corner of the prison and speak to the guard and he will tell you that Khali Brew makes him sleep. Go to the Tavern west of the Fight Arena and speak to the Barman to buy a Khali Brew. Bring this to the guard in the prison to get the keys. Head back to Jeremy and use the keys with the prison door to open it, and you'll soon find yourself in the Fight Arena. He says that you need to save his father. Defeat the level 63 Ogre, and then General Khazard will tell you that if you defeat him, he will let the family go. You'll then be taken to your cell in the prison. Talk to your cell buddy Hengrad, and in a short time you'll be in the arena again. Defeat the level 44 Scorpion, and then the level 137 Bouncer. Once you defeat them, you'll go up against General Khazard himself, who is level 112. He has a 2-Handed Sword that looks like Iron. You don't need to defeat him, and you can just head back to Lady Servil and claim your reward. Quest complete!